Gathered Blooms is a humble sharing of pointers to truth, gathered on the path way to reality. May the mind rest in your eternal embrace. This time I rushed to the Master’s presence with a turbulent mind. On 7th October, peace seemed to be something very distant. I went round Bhagavan’s Samadhi over and over again for thoughts to slow down, which of course did. However the storm did not subside. Meditation was rather difficult as there was a counter thought, a worry, ‘the hankering for peace’. On 8th morning the mind was totally worn out. It suddenly became averse to be engaged in any activity, be it to go round the master or to meditate in the meditation hall. It just dropped its movements. All of a sudden peace descended as I simply sat in the hall in front of the Mother’s shrine, where a black statue of Bhagavan is. Meditation later became fruitful. I felt that these words of wisdom came straight from Bhagavan to bring in the right understanding of issues in me. On 9th morning, the storm in the mind had considerably subsided and I started my journey back to Bangalore. In Bangalore, I happened to tell Saradha akka, the president of the’ Ramana Maharshi Centre for Learning,’ of my visit to the ashram alone. 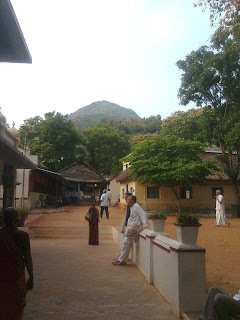 I recounted the account of my wonderful stay, despite not being able to do Giripradikshana or going up the hill to the caves as the asharm always warned women against doing them alone. The right cord was struck! Is He not the greatest musician who fine tunes the mind to the central note that runs through each piece of music? Possessing nothing, is He not the greatest possessor who possessively reclaims the minds of His folks? The words of Shri Nochur Venkataraman, a great devotee of Bhagavan who gives sessions on the Master’s teachings with a touch of experience and emotion popped up in my mind. He had once said, “Bhagavan’s central teaching is to ‘Just be!’ Self-enquiry was suggested because it was difficult for one to drop the mind that is accustomed to perpetual wandering at one go and just be. Furthermore I remembered reading in one of the books, of the function of the mind that thoughts existed only in the light of one’s attention. When one withdraws one’s attention, they simply drop off. I experienced for the very first time, to let go of tormenting thoughts. Of course the experience is fleeting and the mind is bound to presume its vagabond ways, however I strongly believe that His enveloping Grace is sure to lead the mind to anchor at His Feet someday. Om Namo Bhagavate Shri Ramanaya. Wonderful experiences at the ashram. It seems you witnessed lot of mini miracles during your time there :) And this line is simply beautiful - “Suffering cannot be avoided. It can of course be transcended. You will have to transcend it by understanding it!” I don't know if what I experienced too is a miracle or luck but I've shared my experiences in this site - http://www.spiritual-experiences.com/real-spiritual-story.php?story=820. About Miracles - A Different Outlook! Om Namo Bhagavate Shri Ramanaya! The womb of miracles is Grace, which is none other than the Self. Miracles here, may be defined as not the glaring ones as in Physic powers, Clairvoyance or materialising objects etc that bears the stamp of doership. They are simply divine interference in day to day life that are too very natural, and could often escape from even an alert eye. Such were those which took place in the presence of Bhagavan Ramana Maharshi. It would be the experience of every Ramana devotee, who has dedicated himself to the practice of Self enquiry, to experience the Grace of the Guru enveloping him, taking control of his life. This results in diminishing of the sense of ego-the ‘I’ sense which is identifying oneself with the body and the mind. The showers of Grace in every minute detail of life are inexplicable and beyond one’s imagination; the sudden manifestation of it, yet very subtly and naturally, placing things in order leaves one dumbstruck. Inspired by a quaint little Shiva temple on the way to work on the road side, set amidst a rocky background and green surroundings. Strangely enough, amidst all the traffic of Bangalore, the place simply fills one with peace, as He simply exudes Grace. Just Be!-What is it to be?